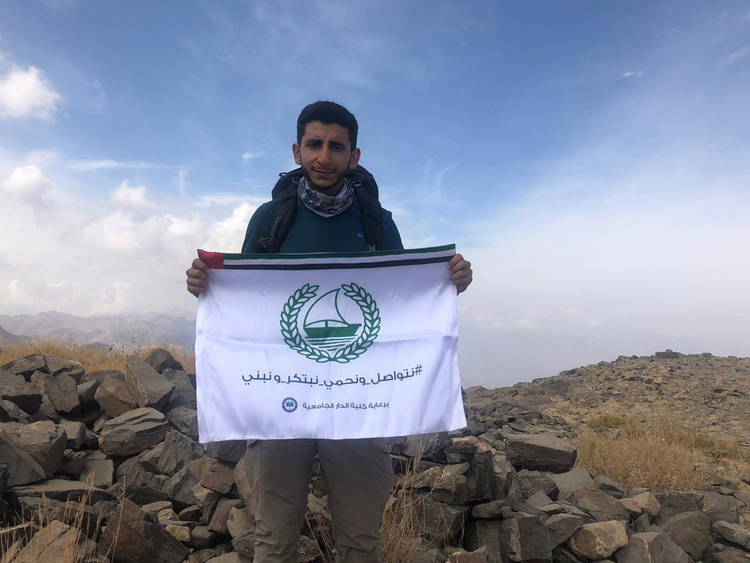 DUBAI: Ahmad Zein Al Yafei, an airport security officer at Dubai Police, has succeeded in flying the banner of Dubai Police at the top of Jebel An-Nabi Shu’ayb in Yemen, after the scaling the mountain in 69 hours. Jebel An-Nabi Shu’ayb is the highest mountain of the Arabian Peninsula and the Levant. It is also the second highest mountain peak in the Arab World. Its peak rises to 3,677m. Al Yafei said, “I decided to complete the mountain challenge and unfurl Dubai Police’s logo in order to present my deepest gratitude to this time-honoured institution that I’m working for”. “My father has been working with Dubai Police for 34 years. The institution is like family and we are proud to belong to it,” Al Yafei noted. “This adventure, which was supported by Al Dar University College (ADUC), was long, tough and full of challenges,” Al Yafei said, explaining how he battled low temperature, pressure and lack of oxygen, besides exhaustion.